While it goes without saying that there was no dearth of fashion marvels at the AIFW 2015, some designers and their creations stood out above the rest. Here is our take on the most dazzling of all collections which shall undoubtedly define the top trends for the autumn-winter season. A Mughal-inspired collection that paid tribute to the Jamali-Kamali monument in Delhi, Anupama Dayal’s collection was subtly inventive and very striking. With a large number of outfits in shades of sandstone, earthy tones were aplenty on her ramp. The brilliant embroidery on necklines and ethno-mod prints she used made the fashion industry admire her avant-garde style. Also, she played with the notion of layering using thin fabrics like chiffon, silk and light cotton to create interesting, tiered outfits. Another designer who received rave reviews and unending praise was Anju Modi. A marked departure from her usual designs, her AIFW 2015 collection was edgy and eclectic, fusing ethnic Indian couture with western styles. Entitled ‘How to Write a Fairy Tale’, her line had much appliqué work and zardozi embroidery, teamed effectively with printed florals and bubble fabrics. The success of her collection can be attributed to the elegance and finesse with which she has combined divergent styles. Her creations are certainly those to watch out for in the future. Veteran designer Nikasha did not disappoint with her inspiring autumn collection. With light hues, monochromatic outfits and fine prints, her line represented soft, feminine elegance. Paired with minimal accessories, more detailed clothing was the hallmark her creations. Outfits from this lovely collection are likely to be widely worn as Indian occasion-wear in the coming season. So if you have a mehendi, sangeet or wedding to attend, Nikasha’s line is sure to have something suitable. EKA’s collection was undeniably the surprise element of the AIFW 2015. It attempted to recreate yesteryear winter fashion, offering a cozy, familiar experience to the target audience. With pastel colours, classic deep shades and interesting patterns in abundance, this line of clothing garnered much attention from all fashion stalwarts. The revival of peacoats, shawls, thigh-high-slit skirts, baggy pants, beanies and loose blouses made EKA’s creations an enthralling experience, visually as well as intellectually. Hats off to EKA for allowing us a throwback into the past of Indian fashion, with skilful remodelling into contemporary styles. Nikhita Tandon’s Mynah Designs collection was beautiful – there’s no other way to put it. An absolutely delightful line for those who love classic styles and conventional structures, it received much appreciation on account of its grace and simplicity. Beautiful drapes, structures silhouettes and timeless shades of red and black dominated her ramp. With a singular focus of dresses and their varied form, Mynah Designs are meant for the young woman of today who is caught between the extremities of convention and modernity. No wonder Nikhita’s outfits made such a huge impression on audiences! 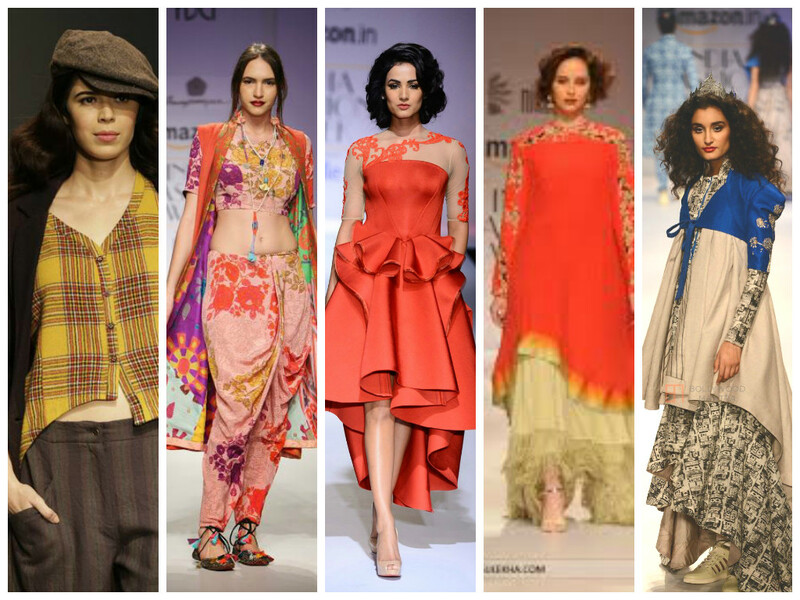 These are the designers who grabbed eyeballs, wowed audiences and won all our hearts this AIFW 2015. Hope you are all inspired to build a great autumn-winter wardrobe based on their brilliant stylistics.